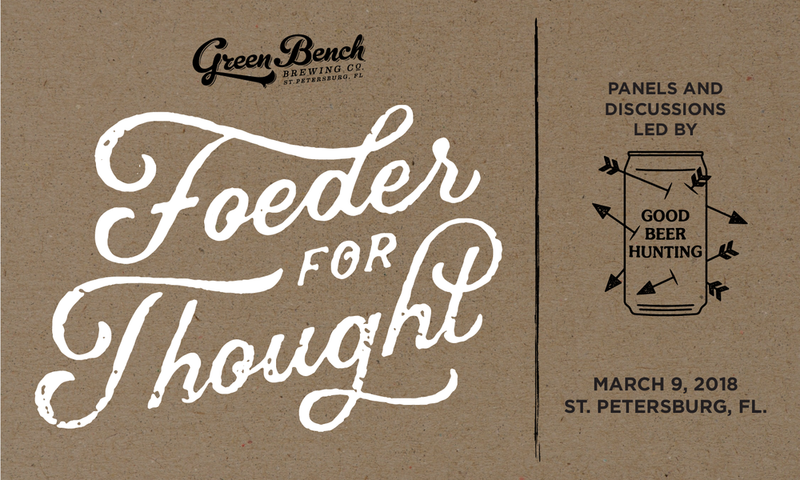 At this year's Foeder for Thought, the festival of funky, wild, and sour beers hosted by Green Bench Brewing Co. in St. Petersburg, Florida, the GBH team will be co-hosting panels and discussions that help us all dig in to the future of this loosely-defined, but highly-sought-after category of beers. Bob Sylvester of Saint Somewhere Brewing Co.
Side Project Brewing, Funk Factory Geuzeria, Speciation Artisan Ales, American Solera, Cascade Brewing, Wiseacre Brewing, Jolly Pumpkin Artisan Ales, Jester King Brewery, Yazoo Brewing Co., DeGarde Brewing, Crooked Stave, New Belgium, Odd Breed Wild Ales, Atom Brewing Co., Creature Comforts Brewing, and many more to be added! Tickets ($100) on Brown Paper Tickets.